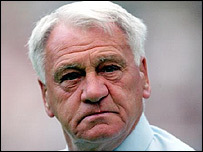 Newcastle United manager Sir Bobby Robson has been honoured with induction into English football's Hall of Fame. Former England manager Robson is one of four managers to be honoured, including Tottenham legend Bill Nicholson. Stan Cullis, who led Wolves to their first league titles in the 1950s, and former Arsenal boss Herbert Chapman are the other two managers to have been honoured. The Hall of Fame selection panel of 15 judges also named England manager Hope Powell as the women's game representative. Robson is widely regarded as one of football's greatest figureheads, having dedicated 54 years to the game. After a spell in charge of Fulham, Robson took up the reigns at Ipswich, leading the unfashionable Suffolk club to the 1978 FA Cup and 1981 Uefa Cup. As national manager he led his country to the quarter-finals of the 1986 World Cup finals and semi-finals four years later. Spells with PSV Eindhoven (twice), Sporting Lisbon, Porto and Barcelona followed before Robson returned to his native North East to revive the fortunes of Newcastle United, where he is still in charge to this day. Nicholson made his name at Spurs, leading the North London club to the league and Cup Double in 1961 - the first time the feat had been achieved in the 20th century. There followed a European Cup-Winners Cup, the first European trophy by a British team, and a run of success in the FA Cup. He retired in 1974 with a record every consequent Tottenham manager has been measured against - and struggled to live up to. Though Cullis never won a trophy in Europe, he brought unprecedented success during his 16 years as Molineux. Cullis was lucky to have some of the era's great players in his side, including wing-half Billy Wright, the England captain. Wolves won the League championship in 1954, 1958 and 1959, finished runners-up in 1950, 1955 and 1960, and came third in 1953 and 1956. They also lifted the FA Cup in 1949 and 1960. Chapman first found success at Huddersfield where, after winning the FA Cup in 1921, his Terriers' team became the first team ever to win three successive Championships, from 1924 to 1926. He left Huddersfield for Highbury in 1925, and, after a few years of moderate success, led Arsenal to their first trophy in 1930, beating Huddersfield in the FA Cup final. The League title followed in 1931 and in 1933. Chapman died in January 1934, but the foundations he laid at Highbury saw the Gunners go on to win league titles in 1934 and 1935. 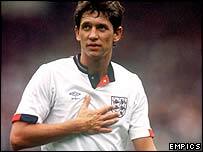 Last week, former England captain and BBC presenter Gary Lineker was among eight players honoured, along with World Cup winner Alan Ball, and a trio of goalkeepers. Former Manchester United keeper Peter Schmeichel and Tottenham and Arsenal hero Pat Jennings, were two of the goalkeepers honoured. The other was Arthur Wharton, England's first Black professional footballer. Two formidable England strikers of yesteryear - Tommy Lawton and Stan Mortenson - also took their place in the Hall of Fame, as did Spurs legend Danny Blanchflower. The first group of inductees featured 23 players and six managers selected by a panel of 20 experts, including Gordon Banks, Sir Bobby Charlton, Sir Stanley Matthews, George Best and Eric Cantona. The Hall of Fame is, like the National Football Museum, is based at Preston's Deepdale Stadium. New members will be added each year. Managers: Sir Matt Busby, Brian Clough, Sir Alex Ferguson, Bob Paisley, Sir Alf Ramsey, Bill Shankly. Players: Gordon Banks, George Best, Eric Cantona, John Charles, Sir Bobby Charlton, Kenny Dalglish, Dixie Dean, Peter Doherty, Duncan Edwards, Sir Tom Finney, Paul Gascoigne, Jimmy Greaves, Johnny Haynes, Denis Law, Nat Lofthouse, Kevin Keegan, Dave Mackay, Sir Stanley Matthews, Bobby Moore, Bryan Robson, Peter Shilton and Billy Wright.